82. 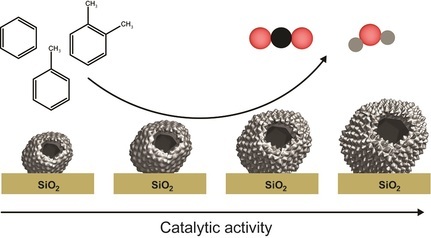 Kisukuri, C. M.; Reis, J. L. M. S.; Rodrigues, T. S.; Camargo, P. H. C.; Andrade, L. H. Evaluation of AgPd Nanoshells in Dual Catalysis: One-Pot Silane Oxidation and Reduction of Organic Compounds. ChemCatChem, 2016​, 8, 3657. 81. Rodrigues, T. S.; da Silva, A. G. M.; Gonçalves, M. C.; Fajardo, H. V.; Balzer, R.; Probst, L. F. D.; da Silva, A. H. M.; Assaf, Camargo, P. H. C. On the Catalytic Properties of AgPt Nanoshells as a Function of Size: Larger Outer Diameters Lead to Improved Performances. Langmuir, 2016​, 32, 9371. ​80. Robson, S.; Yang, M.; Choi, S.-I. ; Chi, M.; Luo, M.; Zhang, C.; Li, Z.-Y. ; Camargo, P. H. C.; Ribeiro, S. J. L.; and Xia, Y. Facile synthesis of sub-20 nm silver nanowires through a bromide-mediated polyol method. ACS Nano, 2016, 10, 7892. 79. Rodrigues, T. S.; da Silva, A. G. M.; de Moura, A. 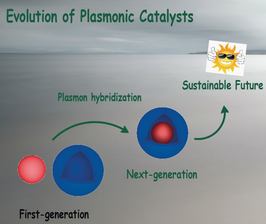 B. L.; Freitas, I. G.; Camargo, P. H. C. Rational Design of Plasmonic Catalysts: Matching the Surface Plasmon Resonance with the Lamp Emission Spectra for Improved Performances in AgAu Nanorings. RSC Advances, 2016, 6, 62286. ​78. Yamada, L. K.; da Silva, A. G. M.; Rodrigues, T. S.; Haigh, S. J.; Camargo, P. H. C. Bimetallic Au@Pd-Au Tadpole-Shaped Asymmetric Nanostructures by a Combination of Precursor Reduction and Ostwald Ripening. ChemNanoMat, 2016, 2, 509. - Featured on the back cover! 77. da Silva, A. G. M.; Rodrigues, T. S.; Correia, V. G.; Alves, T. V.; Alves, R. S.; Ando, R. A.; Ornellas, F. R.; Wang, J.; Andrade, L. H.; Camargo, P. H. C. Plasmonic Nanorattles as Next-Generation Catalysts for SPR-mediated Oxidations Promoted by Activated Oxygen. 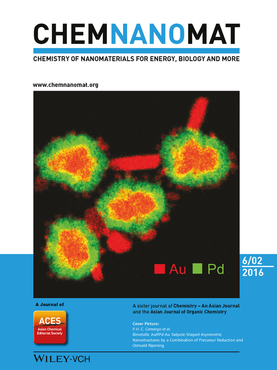 Angewandte Chemie International Edition, 2016, 55, 7111. 76. da Silva, A. G. M.; Kisukuri, C. M.; Rodrigues, T. S.; Candido, E. G.; de Freitas, I. C.; da Silva, A. H. M.; Assaf, J. M.; Oliveira, D. C.; Andrade, L. H.; Camargo, P. H. C. MnO2 Nanowires Decorated with Au Ultrasmall Nanoparticles for the Green Oxidation of Silanes and Hydrogen Production under Ultralow Loadings. Applied Catalysis B: Environmental, 2016, 184, 35. 75. Rodrigues, T. S.; da Silva, A. H. M.; da Silva, A. G. M.; Ceara, D. G.; Gomes, J. F.; Assaf, J. M.; Camargo, P. H. C. Hollow AgPt/SiO2 Nanomaterials with Controlled Surface Morphologies: Is the Number of Pt Surface Atoms Imperative to Optimized Catalytic Performances? Catalysis Science & Technology, 2016, 6, 2162. 74. da Silva, A. G. M.; Fajardo, H. V.; Balzer, R.; Probst, L. F. D.; Camargo, P. H. C.; Robles-Dutenhefner, P. A. Efficient Oxygen Storage of Ceria-Silica Catalysts: Improving the Catalytic Performance of Ceria-based Materials with Ordered Structure. Chemical Engineering Journal, 2016, 286, 369. 73. Slater, T. J. A.; Janssen, A.; Camargo, P. H. C.; Burke, M. G.; Zaluzec, N. J.; Haigh, S. J. STEM-EDX Tomography of Bimetallic Nanoparticles: A Methodological Investigation. Ultramicroscopy, 2016, 162, 61. 72. Kisukuri, C. M.; Palmeira, D. J.; Rodrigues, T. S.; Camargo, P. H. C.; Andrade. 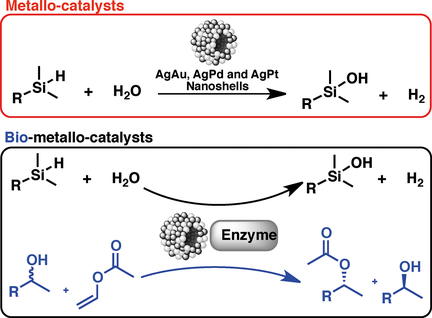 L. H. Bimetallic nanoshells as platforms for metallo- and bio-metallo catalytic applications. ChemCatChem, 2016, 8, 171. 71. da Silva, A. G. M.; Rodrigues, T. S.; Taguchi, L. S. K.; Fajardo, H. V.; Balzer, R.; Probst, L. F. D.; Camargo, P. H. C. Pd-based Nanoflowers Catalysts: Controlling Size, Composition and Structures for the 4-nitrophenol Reduction and BTX Oxidation Reactions. Journal of Materials Science, 2016, 51, 603.